Bisons celebrate a goal against Lethbridge last season. 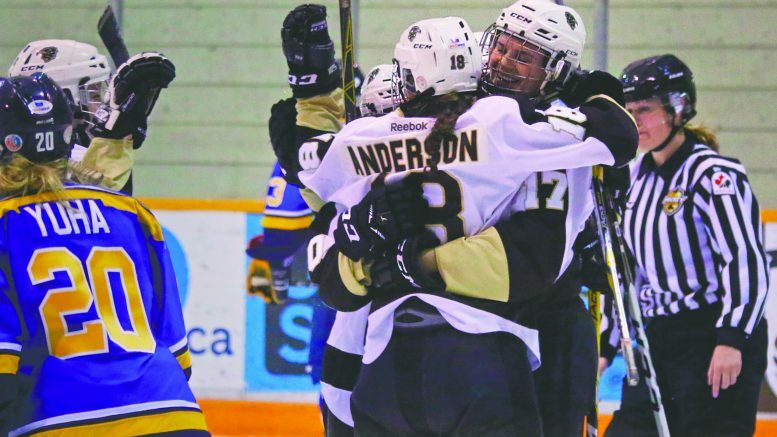 The University of Manitoba women’s hockey team will be back on the ice with even higher expectations from last season. During the 2016-17 U SPORTS season, the Bisons placed third in the Canada West division with a 19-7-1-0-1 record. 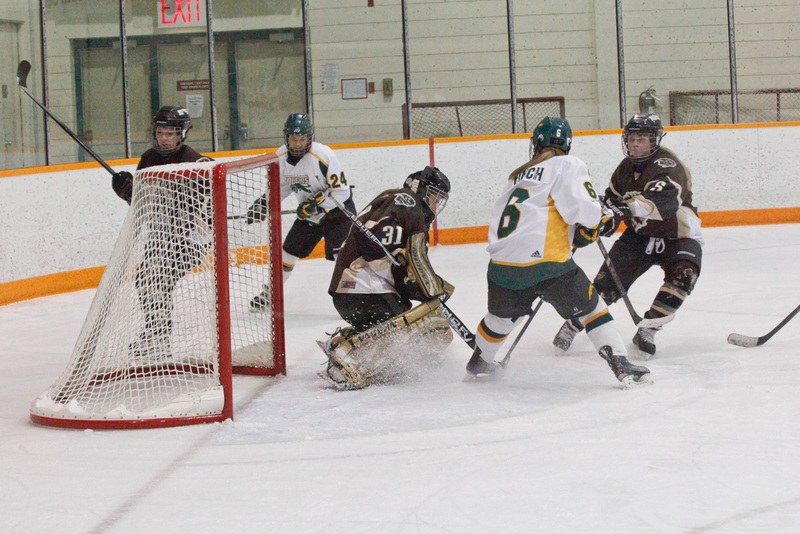 But the herd bowed out of the second playoff round with two straight losses to the University of Alberta Pandas after sweeping the Mount Royal Cougars in the opening bracket. It was a disappointing finish for a club that had a legitimate shot at the Canada West title and the chance to chase a national championship. This year, the Bisons will look to right that wrong, and fans have quite a few reasons to be optimistic for a team that saw very little change in the off-season. Last season, multiple Bisons were honoured for their play and many are returning for another tour of duty. Forward Lauryn Keen was selected as the Canada West Outstanding Player of the Year , and was named a first team all-star. She led not only the Bisons, but the entire Canada West in scoring, tallying nine goals and 25 assists in 28 games. She added five more points in the playoffs . Also receiving the all-star nod were goaltender Rachel Dyck, defenders Alexandra Anderson and Erica Rieder, and forward Venla Hovi. Keen and all four other all-stars will be back on the ice this season for the Bisons. The accolades did not stop there, as head coach Jon Rempel was tapped as the Canada West Coach of the Year. This was Rempel’s fourth time winning the honour in his 13 year tenure with the herd. Under his award winning guidance, the Bisons will surely be a favourite to take the Canada West – and potentially U SPORTS – crown in 2017-18. Hovi, Rieder, and Anderson bring more than their awards to the Bisons. They carry a wealth of international experience earned this past year. Hovi – Manitoba’s Finnish phenom – donned the white-and-blue of her home country during the 2017 Women’s World Hockey Championship, recording a goal and two assists on the way to a bronze medal finish. This is Hovi’s fourth medal on the international stage, going along with two previous World Championship bronze, and an Olympic bronze during the 2010 games. Rieder and Alanna Sharman also pulled on sweaters for their country, wearing the maple leaf during the twenty-eighth Winter Universiade in Kazakhstan. Sharman recorded a goal and seven assists in five games, while Rieder tallied a goal and an assist, on the way to a silver medal. Anderson joined her teammates in the international festivities when she took part in the Hockey Canada Summer Showcase Camp. She was able to take part in a professional calibre training camp, with on- and off-ice workouts, nutrition classes, and media training. This was followed by exhibition games played against the Canadian National Women’s Development Team, and the Japanese National Team. The experienced gained by these four Bisons by playing against top level talent and training under world-class coaches will be something they bring back with them for the new season. If there was a single part of the system instituted by Rempel and the rest of the Bisons coaching staff last year that deserves recognition, it was the special teams work. At the close of the 2016-17, Manitoba ranked first in Canada West with a power-play percentage of 23.4 per cent. The next closest group was UBC’s 19.3 per cent that produced 32 power-play goals in 166 opportunities. While higher in magnitude than the Bisons 25 goals on 107 opportunities, the Thunderbirds were not nearly as efficient. On the other side of the puck, the Bisons were also top of the conference on the penalty kill. The herd killed off 91.5 per cent of penalties – with only seven power-play goals allowed on 82 opportunities – slightly edging out the University of Saskatchewan at 91.1 per cent. When the Bisons’ special teams are clicking, the team is near unbeatable, but when it is not, they may be in trouble. During the 2017 Canada West playoffs, their powerplay only operated at 18.2 per cent efficiency and their penalty kill at 78.6 per cent – good for third and fifth in the conference, respectively. While this was spread over a smaller sample, only four games, the team the Bisons eventually lost to was more efficient on similar chances. The University of Alberta had a top ranked power-play at 33.3 per cent, tallying five goals on 15 chances, three more goals on four more chances than Manitoba. Only UBC took more penalties than the Bisons, 20, but gave up the same amount of goals, giving them an 85 per cent efficiency over six games. Dyck played another stellar season in goal for Manitoba last year, finishing near the top of every major statistical category. Of all qualified goalies in Canada West – those playing 540 minutes or more – Dyck ranked fifth in goals against average with 1.51, second in save percentage with 0.931 per cent, tied for first in shutouts with five, and tied for first in wins with 15. With a 15-6-1 record she was a major factor in the team’s success. This trend continued into the playoffs where Dyck ranked second in goals against average with 1.52, fourth in save percentage with 0.914, and recorded a shutout when sweeping the Mount Royal Cougars. These numbers aren’t coming off a flash in the pan season, either. Dyck has a career goals against average of 1.81 and save percentage of 0.920. She will be a major determining factor for the Bisons in the upcoming season and will again be an All-Star contender. A final point that should have University of Manitoba hockey fans excited is the ability this team has to put the puck in the net. The team finished just two goals behind UBC for first in goals among Canada West teams, recording 84 in 28 games, which winds up being an average of three goals per game. Even better considering the team had a 1.64 goals against average. The Bisons’ top five scorers – Keen, Hovi, Sharman, Anderson and Karissa Kirkup – will all be returning, including the conference’s top scorer in Keen. Don’t let the earlier than expected playoff exit fool you, this team is the real deal, and may be the University of Manitoba’s best hope at a national championship.